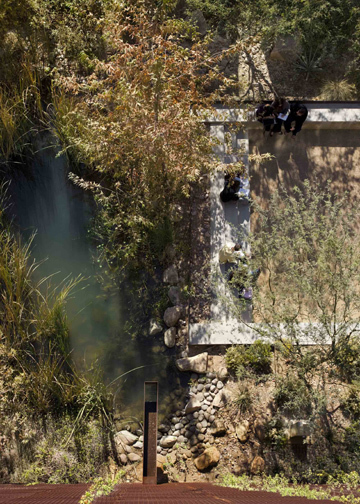 There have been a few articles lately about the new Underwood Family Sonoran Landscape Laboratory which is a part of the School of Landscape Architecture at University of Arizona. 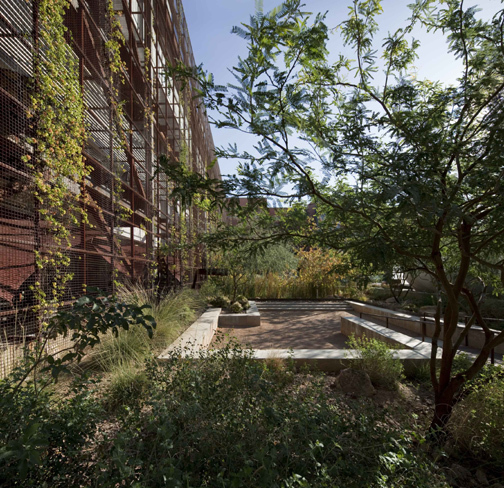 Arizona is known for its arid climate, but this project uses an innovative take on irrigation to provide a lush landscape for this jewel of a space. In addition to creating a wetlands biome, complete with an 18,000 gallon pond, the project provides an 11,600 gallon cistern for water harvesting. The water harvesting is provided from four sources – and rainwater is not the largest source of water. Of the approximately 250,000 gallons of water harvested each year about 40% comes from condensate from the air conditioning units, 33% comes from rainwater runoff from the roof, 18% from well water blow off and 9% from greywater collection (from sinks and drinking fountains. This water harvesting accounts for 83% of the water required for the landscape on an annual basis. 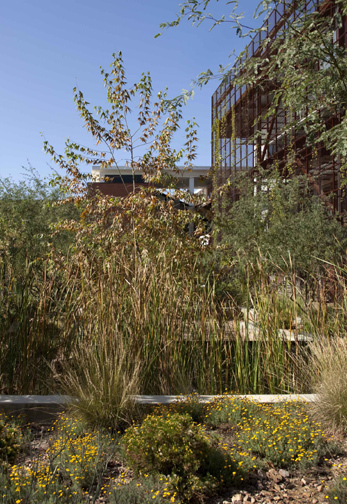 In addition to the water harvesting, the garden includes a significant green wall with planted vines adding to the shading from the hot desert sun on the southern façade of the building. Next up, they are looking at creating a desert green roof which can be monitored for research data. If this is available in a desert environment, think of the potentials for harvested water elsewhere. University of Arizona News had an article about the facility that provides more information on the project. Check out their photo of the large water collection system in action. 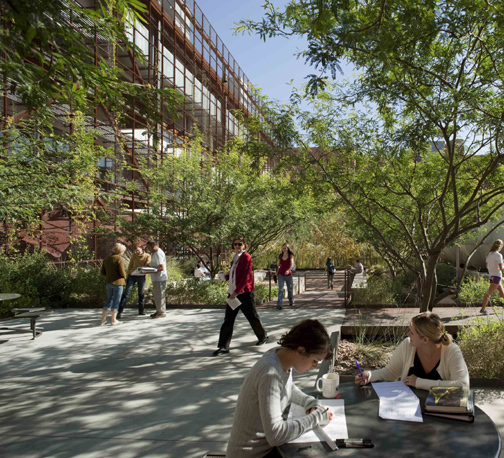 Ten Eyck Landscape Architects were the landscape architects for the project.